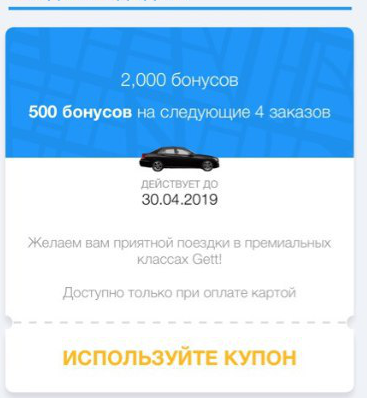 The promotional code gives a 2000r discount on 4 trips (500 rubles for each trip) in Gett Taxi in business and VIP classes when paying for a trip with a card (a card must be linked to the account). Promotional code is valid on new and old accounts. You can activate one promo code of this type for one account. If you have already activated this type of promotional code on your account, then you should not buy this promotional code. IMPORTANT !!! 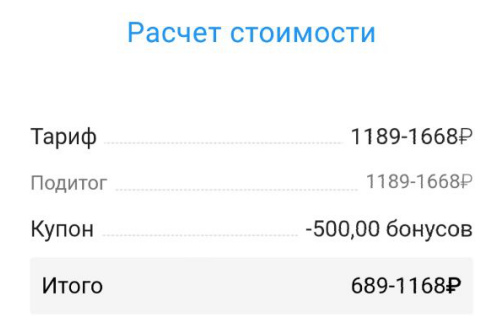 The trip should cost more than 500 rubles, if the trip is cheaper, the discount will not work !!! Discount only on travel at Business and VIP rates !!! Discount does not apply to pre-order a taxi. Operates in cities: Moscow, St. Petersburg, Yekaterinburg, Kazan, Novosibirsk, Sochi, Krasnodar.